PHILADELPHIA (March 4, 2015) – The Rendell Center for Civics & Civic Engagement has moved its headquarters to the Annenberg Public Policy Center of the University of Pennsylvania, and the two institutions will collaborate on projects to strengthen civics education in schools, it was announced today. The Rendell Center, a nonprofit, nonpartisan organization led by Judge Marjorie O. Rendell of the 3rd U.S. Circuit Court of Appeals, will be working with the policy center on educating young people and promoting civic engagement. The Rendell Center has focused on civics-curriculum development for children in the lower grades, while the Annenberg Public Policy Center (APPC), through its Leonore Annenberg Institute for Civics, has concentrated on civics in middle and high school. “I’m looking forward to working with the Annenberg Public Policy Center to have an even greater impact on civics education,” said Judge Rendell, the chair of the Rendell Center. Judge Rendell, who co-founded the center with her husband, former Pennsylvania Governor Ed Rendell, announced in January that she will be moving to “senior status” with the 3rd Circuit this summer, giving her a lessened case load and more time to devote to civics education. 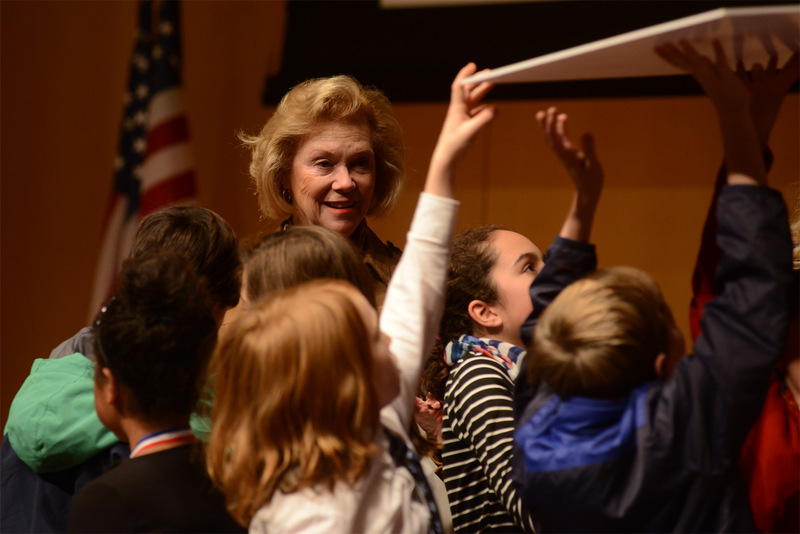 Judge Marjorie O. Rendell oversees the Citizenship Challenge at the National Constitution Center in December 2014. The Rendell Center originated with Judge Rendell’s initiative as First Lady of Pennsylvania, PennCORD, the Pennsylvania Coalition for Representative Democracy. Continuing her civic education activities, Judge Rendell, joined by former Governor Rendell, created the Rendell Center at Arcadia University in 2013 in collaboration with the National Constitution Center. Arcadia and the Constitution Center will continue to work with the Rendell Center in its new home at the University of Pennsylvania.